Drinking tea could make the daily rat race a bit easier, according to Jane Rycroft, a nutrition manager and tea researcher at the Lipton Tea Institute in England. Rycroft was one of the speakers at Dubai's first Lipton Tea roundtable at the Palace Hotel last week. Surrounded by posters illustrating the evolution of tea leaves from the plantation to your cup, Rycroft explained why a cup of tea will do you good. "Now if you think about your everyday lives, you're probably juggling so many things. You have so many things on your mind all the time and that leads to a mind overload. "You're always trying to make decisions and can never feel relaxed and as a consequence, people feel really stressed," Rycroft said. 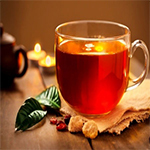 Tea can play an important role in giving you a "gentle physical and mental boost and clear your mind", she said. Tea contains a unique amino acid called theanine which, studies have shown, generates brainwaves that put the mind at ease. "It puts people's minds in a much more relaxed state," Rycroft said. Separately, studies have shown that tea is beneficial to your long-term health, according to Rycroft. "There's a strong connection between tea consumption and heart health, you get a 10 per cent reduced risk of getting a heart attack with every three cups of tea, and 20 per cent reduced risk of getting a stroke with three cups of tea," she said, noting that tea allows blood vessels in the body to open up. "When you have around two to three cups of tea, you find your blood vessels are able to dilate much better so if you're running for a bus, your blood suddenly has to pump really hard to your muscles. "Your blood vessels need to relax to get the blood through them and tea is able to relax your blood vessels effectively," she said. But you should limit yourself to no more than eight or nine cups of tea a day, at which point you begin to consume too much caffeine, Rycroft said. She also added that young kids or those who are prone to iron-deficiency anemia -- a condition where the body doesn't have enough red blood cells -- should be careful when they drink tea. "It tends to reduce the rate at which iron from fruits or vegetables can be absorbed in them. "So people in those two groups can still drink it, but should have it an hour or so after you eat." Choosing Dubai for the first discussion on tea makes perfect sense, said Kurush Bharucha, beverages supply chain director for Unilever, which owns Lipton. Bharucha was one of the speakers at the event and talked about how the city is home to many tea lovers. "Dubai is in the centre of a very big tea-consuming population; tea in this area is very popular and people drink it often throughout the day," Bharucha said, who drinks five to six cups of tea a day.